A Desperate Tatter: The first pair. 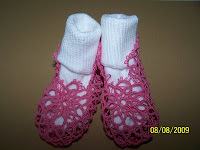 Here they are the first completed pair of booties. I still have the ends to work in but I am very happy with how these have turned out. I did learn a lot by making the test bootie and was able to fine tune some of the areas that were difficult for me to work. My sister in NE thought they looked great and has suggest a very bright green for her new grand daughter. So of course I have had to order the thread as I do not have any of that color. While I am waiting for the new order of thread to arrive I am working on a pair in Lizbeth color 1113 Jewels. I am hoping they look manly enough for a boy. I would want his booties to be to pink. So far I am happy with the color and will be anxious to get t his pair done too. Stopping bye to say thank you for entering my giveaway. Good luck to you in the drawing.